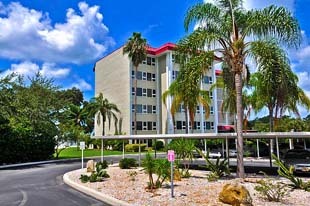 Bays Bluff Condominium is a cozy cluster of condo residences in a six-story building constructed in 1971 at 1100 Imperial Drive, Sarasota, Florida, 34236. The condo has been renovated which involved the installation of new roofing and hurricane windows. Its hallways were also given a makeover and laid with new carpeting. A new emergency power generator was also installed in 2009. The charm of this condominium development lies not only on the snug comfort provided by its residences. Among the Sarasota condos for sale, residences at Bays Bluff rank among those that are desirable for their marvelous bayfront location and proximity to the urban offerings at the city’s downtown district. Afforded with picture-perfect waterfront views, condos for sale in Bay’s Bluff range in floor area from approximately 800 square feet to 1,200 square feet, with either one or three bedrooms. 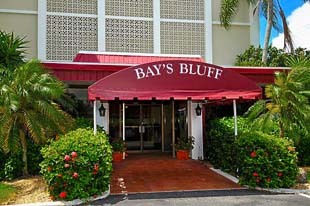 Bay’s Bluff condos for sale can fall somewhere between the high-$100s and the low-$400s. As an investment for a rental condo, it should be considered that a unit at Bluffs Bay can be leased for a minimum of six months once a year. Acquiring a unit in this community either as a rental vacation home or permanent residence is an ideal proposition. There are many pleasant amenities in this property which immensely boost both its value and homely ambiance. Among these are a swimming pool and a sauna, in addition to the elevators and well-manicured landscaping of the condo complex. Additional delights, especially for residents with kids, are offered by the Whitaker Gateway Park adjacent to the property. Named in memory of one of Sarasota’s pioneers, William Whitaker, this park features a playground, picnic areas, a walking and fitness trail, restrooms, and a fishing pier. More water-based leisure possibilities can be enjoyed at the nearby Centennial Park which has boat ramps and sailing charters. The options for lifestyle activities and entertainment abound in other venues near the community. These places include the Van Wezel Performing Arts Hall, a visit to which can extend to excellent nearby dining establishments such as China Garden. Moreover, the condo residents can easily go shopping at the Whole Foods Market and the Publix Supermarket in the downtown area. The chic St. Armands Circle, home to 130 shops and a retinue of bars, cafés, and restaurants, is also minutes away from Bays Bluff. This commercial hub can be reached conveniently via the Ringling Causeway Bridge. A briefly extended trip through this span likewise opens to the fabled Lido Key beaches, charms that work too for the condos for sale in Bays Bluff. Below are all of the current listings of available condos for sale at Bays Bluff.